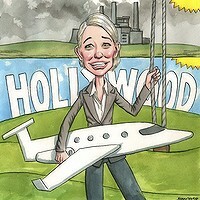 Cate Blanchett, who travels everywhere by first class air travel or private jet, and is worth millions of dollars, lectures ordinary Australians struggling to pay their energy bills on saying “Yes” to a tax that will make their lives even more difficult and achieve precisely nothing for the climate, whether in Australia or globally. Hmm, that will go down well! And as expected, there are all the usual misrepresentations. Let’s go through them shall we? “Yes to less carbon pollution”: False. We would be saying yes to less harmless trace gas carbon dioxide. “Yes to new money for clean energy that never runs out”: “New money” here means government subsidies for inefficient and expensive renewable energy sources. When they are competitive in the market, then people will use them. And as for never running out, wind and solar only work when the wind blows or the sun shines, so solar “runs out” every night, and wind “runs out” when it’s not windy enough. “Yes to help for people struggling with bills”: which are only going to get much, much higher under a pointless carbon tax. And anyway, if we compensate people, they won’t change their behaviour – duh. And Cate’s starring role: “Finally doing something about climate change”: False. A carbon tax in Australia will do NOTHING for climate change, whether you believe CO2 is to blame or not. The ad is very good at confusing harmless carbon dioxide with “carbon pollution”, smoke, soot and dirt – as demonstrated by the usual belching smoke stack photo. Because the more confusion that can be sown in the minds of the public, the more chance of pulling the wool over their eyes, and getting all these misrepresentations and falsehoods past them without being noticed. I am all for reducing proper pollution such as particulates and toxins, but reducing carbon dioxide has nothing to do with this. If the campaign was about reducing “real” pollution by taxing people more, and had nothing to do with “saving the planet”, it wouldn’t get off the ground. But who cares about the facts? As this blog has said countless times, nothing Australia does on its own will make any difference to the climate, and that’s even if you believe that CO2 will cause dangerous global warming. Cate can afford to pay a carbon tax and not even notice (and can always go and live elsewhere if things get too rough here in Australia), and will continue to travel all over the world by fossil-fuel powered means of transport. When she turns up at a film premier on a bike, then we may take some notice. But until then, forget it. FEW Australians would dispute Cate Blanchett’s acting prowess. She is a genuine international movie star who won an Oscar for her role in The Aviator and has banked an estimated $50 million fortune off the back of her success. But that doesn’t qualify her to lecture Australian families — she is the star of a pro-carbon tax TV advertising campaign starting tonight — on why such an impost is good for them. Particularly when Prime Minister Julia Gillard has failed to tell the nation exactly how big this new tax will be. It’s reasonable to assume that cost-of-living pressures are not something that trouble Blanchett, but they are certainly keeping Aussie mums and dads awake at night. Irrespective of whether CO2 increase increases global temperature, there will always be an increase as our cities footprint gets bigger. As long as we strip rain forests away from the Amazon, and other areas the temperature will increase. Why do we not take action to stop these activities? Agree with the sentiment, but people need to realise that as we search for replacements fuels to fossil fuel there are also environmental costs. Replacing fuel for vehicles will result in land clearing to use for bio-fuels on top of the use of land for food production. Britain is soon to be cris-crossed with new power lines for the new bird killing wind farms. The hysteria of carbon dioxide is just amazing. Maybe people should look at what would happen to the world if it continues to cool, it would be a great deal more dangerous for the world than a natural warming period. The real answer to a majority of the issues regarding use of farming land and resouces etc is to control population, but that means taking on organised religion & that wont happen. Very simply a carbon tax will not do ANYTHING to help the rain forests, nor will it leave the genuine people who although they may not believe in global warming, financially able to contribute to “real” environmental projects. Most environmental programmes are expensive and people will not be able to afford to continue the support that is currently occuring, except the likes of the rich eg Ms Cate Blanchett and Mr Michael Caton. It is a myth that the so called “sceptics” (like myself) are not interested the environment but the IPCC’s hypothesis on global warming is and always has been perceived as economic not environmental. But Ross – the current biggest killer of Amazon rainforest is clearing to make way for biofuel crops. A political solution to a non-problem is causing real environmental destruction. The problem happens when people use emotive statements instead of clear, rational thinking. Same for windfarms, hydro electric – you name it. Oh, and Amazon forest doesn’t affect the worlds temperature. You shouldn’t be so easily convinced by false logic and motherhood statements. Ask yourself – how many trees in Brazil will stay standing as a result of an Australian carbon tax? Direct action in Australian govt purchasing Brazillian land would be more effective. Well, to present falsehoods, or to mislead and deceive you need a good actor..
Cate is a air head with acting talent … like do many of her Hollywood contemporaries. She is grossly misinformed as are most of us in the guilt-ridden western world. The problem starts at the education industry. Children are not being taught to understand the natural sciences. They have no clue about geography, astronomy, the solar system, the size of the planet and it’s geological make-up. Therefore they can be easily scared and duped by the witch doctors of climate change. It is no different the the clergy using the fire and brimstone of hell to scare parishioners into showing with their wallets on Sunday morning. The looney left strikes again! If people like Cate Blanchett want to pay more tax to a scheme that will do absolutely nothing to help our environment and will only line the pockets of government and unnecessary and unworkable renewable energy companies, then go for it. Tax the little people, while she traipses around the world in private aircraft … is she serious? If she reduced her ‘carbon footprint’ by staying at home it would do more good for the planet than me paying an unnecessary tax. We’re told that “cost-of-living pressures … are certainly keeping Aussie mums and dads awake at night.” How is it that with the mining boom Australia has never been more wealthy, yet apparently it’s an ever-increasing struggle for the battlers? Mining magnates are making obscene profits from our resources, yet we scream about our government suggesting they pay a little more tax on their super profits. That tax could have been used to compensate the battlers for increasing electricity prices, with others paying more. The mining tax is an entirely separate issue. The key question under discussion here is, what will a carbon tax in Australia achieve? Answer: nothing at all. It won’t change the climate, and it won’t influence China and/or India to change the direction of their economies. So why are we going it alone, other than to appease the Greens and keep Julia in power? That’s a good point, marnit. The fact is that while the mining industry is doing well at the moment, it is plastering over the cracks that run throughout the Australian economy still: manufacturing, construction, retail, all are still struggling. And of course it seems fair that we would ask them to pay more and more of the profits they make back in taxes, however the concern that is never mentioned is just how badly this would effect the superannuation accounts of everyday Australians. Sure we could all get some short term relief now if we started ramping up taxes on the mining companies, but in 10-20 years time we’d have an even bigger welfare class as a result. You can probably understand why the ALP is for such a tax then, welfare dependent citizens, union zombies and uneducated youth being their bread-and-butter. I am sorry but the premise that “Australia has never been more wealthy” does not equate. It seems that those who support the Carbon Dioxide Tax can only talk about the “cost of living pressures” anecdotally. marnit – not everyone works in a mine. Get it? Take a drive around your local area. Mentally calculate how many busineses have closed in the last two years. Look at how many ‘for lease’ signs are in shop windows instead of things for sale. In a proper functioning economy, businesses open, not close. The real thing dragging the Australian economy backwards is lack of confidence. Nobody wants to buy anything, build anything, do anything. Partly this is global uncertainty at a local level. Partly this is because the government is so erratic what might be profitable one year could be taxed or subsidised to death the next. The ‘obscene’ profits for the miners are a result of good planning and a little luck. I assume you won’t mind paying for their losses when things aren’t so good? You can’t build confidence in investment if you realise if you start making some cash the wealth destroyers are going to come in and steal it to fund mindless schemes. hmmmm. So Cate says “Just say Yes” ……….You do NOT need the facts to make an informed decision. You do NOT need the details to form your own opinion. You do NOT need to know if there will be Pain to be felt. Just Say Yes! I am very disappointed and disheartened in Cate Blanchett, one of whom usually campaigns for meaningful and truthful causes. Surely the people in the ad have a right to an opinion, and a right to express it, just as you do, ad hominem. Your biased views against all those who disagree with you are not surprising, but nonetheless, disappointing. People are entitled to express an opinion, but not to mislead, as they do many times in this advertisement. And your views aren’t biased, I suppose? Maybe people’s views are only biased if they don’t coincide with yours? By agreeing to be in a national commerical, she is no longer merely “stating an opinion”, but is actively endorsing public policy, and advocating this policy for residents of Australia. Furthermore, celebrities such as Blanchett do not need to make commercials such as this one for their livelihood. She is clearly agreeing to make these commercials by choice, and hence she also has the ability to walk away if she disagrees with the message being presented. Thus by participating in these commercials, with their deceptions and half-truths, her opinions are very bit as questionable as those of the the ALP/Green/Independent conspiracy that is trying to introduce them. I think you will find that most people here have done research of their own and have based their view after considering both sides of the argument. I for one used to believe in the precautionary principle, until I looked into the issue more deeply, and I now consider the whole issue to be a blight on science itself and the govts pushing the issue for their own agendas. Maybe you should look at the evidence and question the inconsistencies and the alamist rhetoric that has little real scientific evidence. Politicians thrive on fear-mongering. Fear delivers more votes than any other force. Logic and rational thinking based on evidential data deserts human beings when we are faced by fear. Emotion takes over. The script writers know their trade. That’s why the Blanchett-Caton ad does not mention facts – only emotions. If this Carbon Tax ever becomes law another Law will over-power it; the Law of Unintended Consequences. Gillard, Combet et al do not intend to mimic lemmings running over a cliff. But this will be their Unintended Consequence. The Carbon Tax will be the end of Labor, even as an effective opposition, in Australian politics. Bill Shorten might have kept his hands clean on this issue but many years as Opposition Leader must give him nightmares. Due diligence reveals that CO2 is not a cause of atmospheric temperature rise – it is a consequence of natural temperature rise. In 1972 Maurice Strong, Head of the predecessor to the IPCC, grasped global power by corrupting Climate Science; he dictated that Summaries for Policy Makers take precedence over supporting scientific documentation. Scientists had to edit their Reports to comply. The IPCC has continued the escalation of corruption. Since then a parade of climate scientists and hangers-on have plundered global public purses to investigate all sorts of hypotheses purporting to be associated with Global Warming. It is a massive fraud. Don’t take my word for it. Unless you personally conduct due diligence it is difficult, to say the least, to discern the truth. As an environmental activist and former warmist that’s what I did. Go to http://www.galileomovement.com.au and make your own judgements. Well said, Simon. Of course Blanchett’s is not the first demonstration of excruciating hypocrisy and chicanery. Recall Jeremy Irons’ exhortation that we “live less decadently” and Prince Charles’ demand that we “live with less“. The nauseating list is seemingly endless. There may be some justification if the cause was worthy and authentic. Instead, it’s all derived from “pseudoscientific fraud” as the intrepid physicist, Prof Harold Lewis, described alarmist global warming junk. Forget about a Carbon Tax, it’s just a distraction from Bigger Picture issues. For example: The price of oil keeps on sky-rocketing. The AMERICAN dollar keeps weakening. World war 3 is likely not far away under Obama. His a war monger. Hyperinflation will come about in AMERICA very soon, because war creates hyper-inflation. World war 3 is illegal in relation to international law, it will throw the legal system into disarray, no doubt! The AMERICAN dollar is deliberately being set up to implode, by the IMF. A Carbon Tax will need to be made redundant in the near future, because the world will be experiencing a major Global Financial crisis, and the there’s the end times prophecy of 21/12/’12. There is a huge power struggle going in, huge hurdles, that’s what AUSTRALIA will be dealing with. Fortunately, I don’t share your pessimistic outlook. After being seen as a Great Australian, one inwhich We All Respect and Admire, why would a Man like Michael Caton put Himself on The We no longer wish to hear from You Uncle Harry ? We want the Government to return this Country to the Era of the time when You were in The Sullivans… Uncle Harry, Have You forgotten already ? Yeah, there wont be a voice over job for him for on the maccas ad’s anymore, people wont be able to afford it. Its worse for Blanchett, she is an ambassador for fossil fuel buring car manufacturer Audi, on top of all the other hypocrictical activities her lifestyle involves. I recently had an idea. I want to form a company called ‘Sydney Green Healthy Clean Aqua Power’. I will submit press releases about my new plan to ‘dramatically reduce the emissions of Sydney, and to provide clean, green power using the natural resources of Sydney’. After the press are excited, I will release by plans. My plans will be to construct 500 wind turbines mounted around the shoreline around Sydney harbor. Naturally the best location will be around Hunters Hill and Point Piper. Just around the opera house and Manly as well. Coupled with these wind turbines will be very large PV solar arrays, to capture all that glorious sydney sunshine. Naturally, I will admit that these are all true, and announce plans to wind up the company. But not until I’ve made the point that this is true for every wind installation – so what is not OK for residents of Sydney Harbour is, by extension, not OK for other parts of Australia. I’d be very curious as to what Cate would think of 500 big monstrosities around the Harbour. I will support your company. I think it is a fantastic idea to put the wind turbines right in the city, where the green power can be watched and heard just on their balconies. Look at savings in the carbon foot print. Less power lines coming in from the country towns to support such a huge city. Kids can even play near them, don’t worry I know of a whole Queensland State Labour Government that will swear black and blue that they are 100% safe. Furthermore why not put a few CSG wells down, and Sydney can use the water to drink. They will never have a problem with water shortage again. Is the Water safe?, I hear you asking. Of course it is, I know a Queensland State Labour Government that would again swear black and blue that it is completely safe. Why else would they put them in our back yards and not their own! I will never watch another one of Cate’s film. She’s had her chance to voice her opinion – now I’ve got the chance to voice mine with my money. Cate has not just alienated Australian audiences, but audiences world wide who are struggling in to make ends meet and can’t afford any more taxes or rises in the cost of living. Cate Blanchett – Just say no! Why can’t any of these columnist or advertising programs ever explain HOW their lovely plans to reduce C02 will actaully work? Australian industry is already cleaner than Chinese industry, so implementing ridiculous treaties like Kyoto and Copenhagen which increase the costs to the cleaner Australian industry while giving the dirty industry in China a free pass will only increas pollution, not reduce it. The increased regulations and taxes will make the cleaner Australian industry less competitive so more production will move to the dirty factories in China. Oh, wait, I guess that’s why they never try to explain how it will work! It won’t, it will increase pollution. I’ve read hundreds of columns on the wonders of the Kytoto and Copenhagen treaties and the horrors of AGW, but I’ve never seen one that explains how they will accomplish their intended goal. They are all desperate to convert us to their religion, but for some strange reason they won’t simply tell us HOW it will work.